Figuring out last minute Saturday night plans at home in the burbs recently, my wife and I were surprised to find dinnertime slots available on OpenTable for Capofitto, a hot newish Italian restaurant in Philadelphia’s wonderful Old City section. This is a place we’d read about when it opened last autumn. It sounded good and also intriguing, as it contains a ten ton pizza oven that was built by three Italian masons on site from bricks and other materials boated over from Italy. Clearly this is an establishment that takes its pizza seriously, which makes me smile. Quickly we made an OpenTable reservation, shot off to a suburban train station, and rode the rails into Philadelphia. After dinner we planned to catch a movie, Dior And I, at the Ritz Bourse art house cinema, one block from Capofitto. We silently congratulated ourselves for developing such an efficient plan for the evening. 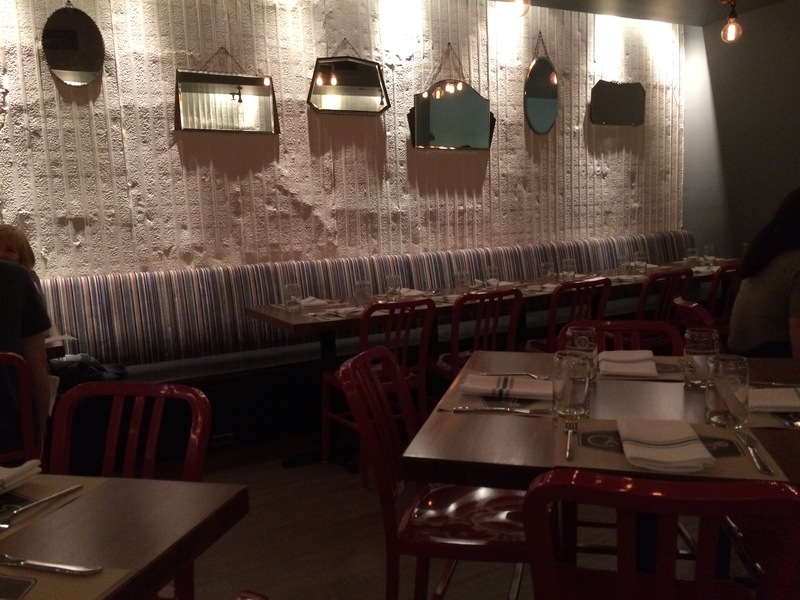 Capofitto (233 Chestnut Street) is a good looking place, fairly wide and very long, comfortable but not too fancy. Housed in a building about 115 years old, its modern décor somehow gives off the vibes of a traditionally-decorated Italian eatery. The restaurant is owned by Stephanie and John Reitano, who have placed a geletaria in the front room. This is understandable, as the Reitanos blessed Philadelphia earlier this century with a scattering of mucho popular gelato cafés. Capofitto expands the culinary parameters of the Reitano empire. The first important question is: What beer did I order? An Italian one would have been appropriate, but for the fact that Capofitto’s beer menu listed a brand I’d never heard of before, from a country I’d never given any thought to as a beer producer. Iceland of all places. 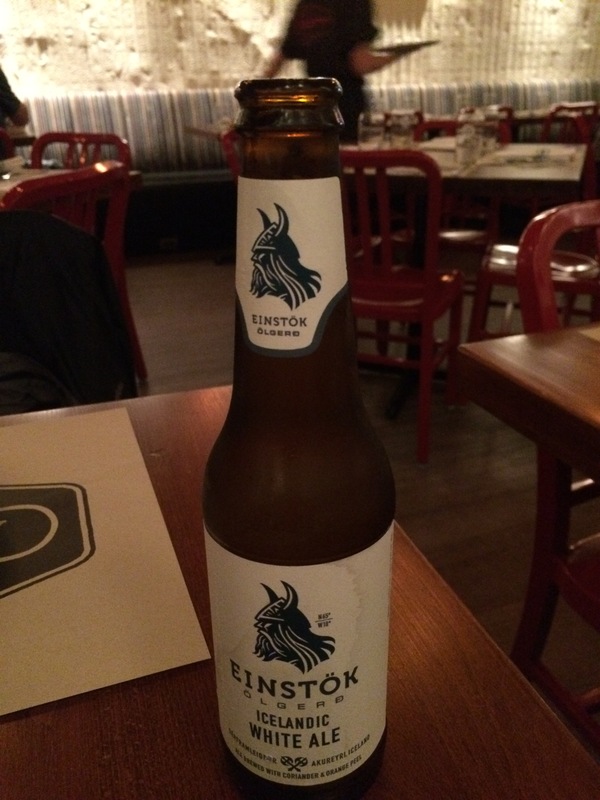 Next time at this sweet restaurant I’ll drink Italian, but this night it had to be Einstök brewery’s Icelandic White Ale. This is a wheat beer whose label implies that the brewers toss orange peels and coriander into the vat. I noticed those flavors, but unexpectedly I also found a substantial hint of celery wafting up to my nostrils. Must have been the hops, weird dudes that can impart all manner of tastes and aromas to beer. Regardless, the ale had bite and was refreshingly bubbly and I liked it a lot. 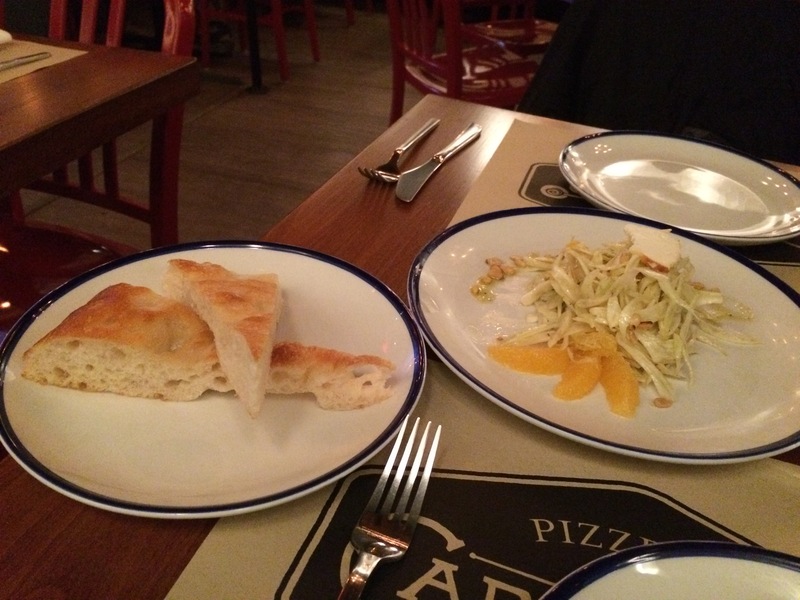 Capofitto’s pinoli salad and focaccia bread. What then did we have for dinner? Pizza of course, preceded by a pinoli salad. Pinoli? That’s pine nuts to you and me. My wife and I shared both the salad and pizza. The salad was misnamed, being composed largely of shredded fennel and orange slices, and brought to life with a fine milky dressing and ricotta cheese. And with some toasted pinoli too. We thought much of the salad, though a lot more pinoli wouldn’t have hurt. With the salad came focaccia bread, very good indeed. 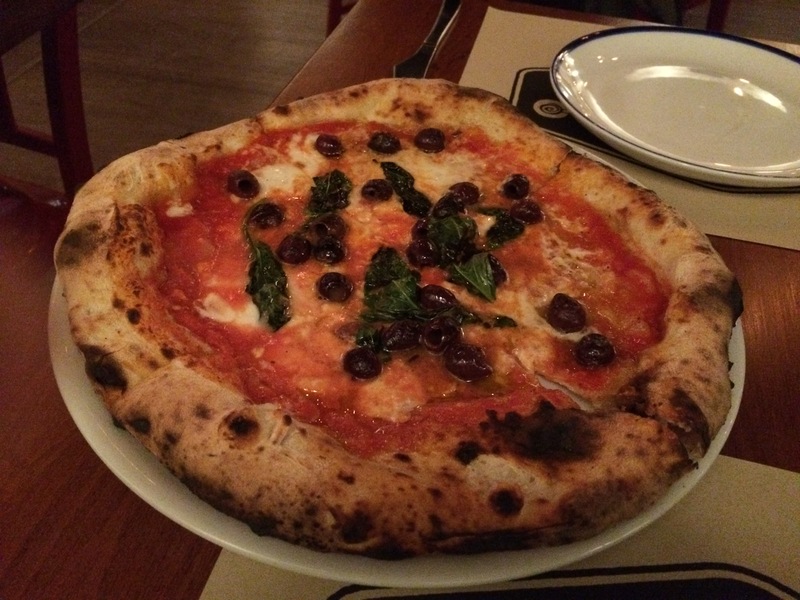 Our pie, a margherita to which we added salty black olives, was fabulous. The pie crust’s body was thin and crisp, its puffy rim chewy in a satisfying way. The entire crust was heat darkened and blistered here and there, the good quality wheat’s earthy flavor shining through. It’s not every pizza whose wheat catches your attention. My wife and I sighed contentedly as we munched away. This was one of the best pizzas I’ve had in recent years. 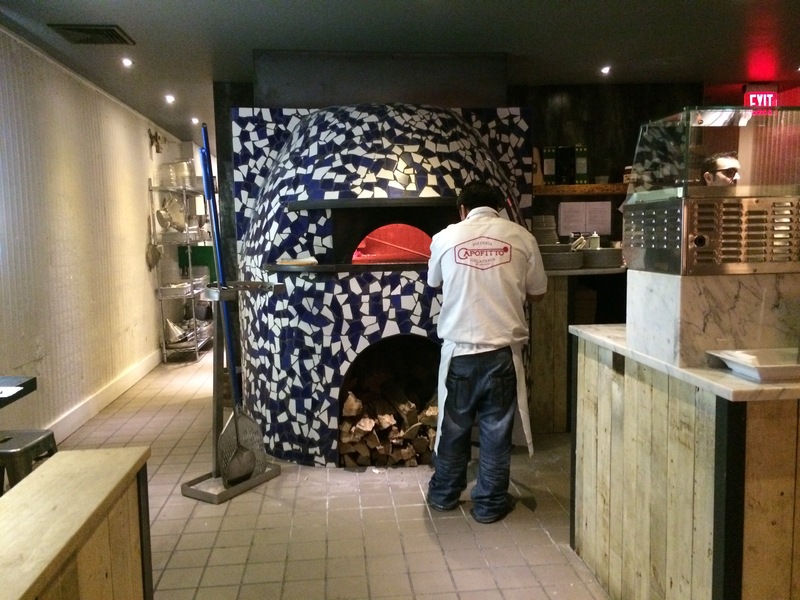 The pizza oven, by the way, is a beauty. I looked it over for a few minutes. Capofitto feeds it wood, oak to be more precise, and it reaches very high temperatures, 900 degrees Fahreinheit or higher. Miraculously it bakes a pie in about 90 seconds. Now, Capofitto has a large menu. Pizzas, salads, cold meats, cheeses, a few pasta dishes. I’d be surprised if most everything on it isn’t good to excellent. But after the pizza we were stuffed enough and didn’t eat anything more, not even the gelatos that brought the Reitanos their initial fame. We will return to Capofitto, at which time we’ll explore sections of the menu we didn’t get to. For now, on to the movie. 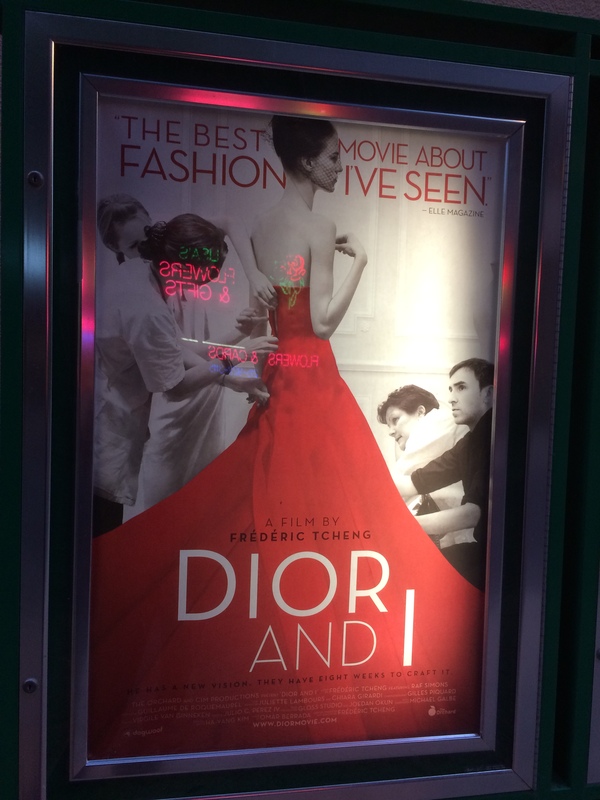 The poster for Dior And I outside the Ritz Bourse. No one, most notably my wife, would describe me as a fashionisto. I am aware of trend-setting looks and high fashion, but the road sort of ends there. But like most anything, the world of high fashion, if explained and presented properly, will jump to life even for the mildly interested. At the Ritz Bourse my wife and I, as planned, watched Dior And I. Well-paced and well-developed, it is a documentary about the cloistered world of haute couture. It is very good, worth seeking out. Three out of four stars, I’d say. Dior And I, directed by up and comer Frédéric Tcheng, follows the travails and successes of Raf Simons during the initial phase of his new job in 2012. For in April of that year, Simons, who had made his name in men’s fashion design, was hired by Paris’s world famous House of Dior as creative director for its women’s lines. Lucky Raf’s first big project began immediately. He had all of eight weeks to design and present Dior’s 2012 fall-winter haute couture collection. A snap, right? The documentary begins with Raf’s first day at work, when he is introduced to the seamstresses and other staff now under his direction. Throughout the film Simons appears shy, which makes me wonder how he managed to rise to so high a creative and managerial position. Turns out that the House’s founder, Christian Dior, possessed traits similar to Simons’s. The private Dior was a reticent man, uncomfortable with the public demands of his occupation. Simons is aware of the founder’s bearings. On camera he says that he once began reading Dior’s memoir, only to put it down forever after a short while because he recognized too much of himself in Dior’s personality. Wait, this is a spoiler alert: At the end Simons triumphs, a survivor of the strained nerves and pained expressions that accompanied him during his test by fire. The haute couture show, held on July 2, 2012 in a majestically flowered Parisian mansion, is a hit. There the movie ends. Today, almost three years later, Simons is still on the job. He undoubtedly has grown more comfortable in it.